The ring leader of Japan's second generation of great ramen chefs, Nakamura opened his first ramen-ya at 22, and by 25 he became one of the most recognized ramen masters in Japan, thanks in part of his Instagram-video-worthy signature style of shaking his noodles. "The move" is sort of a cross between the upper-half of the Karate Kid's crane stance and performance art. A 30-year-old (and second generation) noodles operation that actually supplies artisanal custom noodles to most of the best ramen-ya's in NY, as well as the rest of the country, Sun Noodles has factories in Hawaii, California, and New Jersey, with the latter alone selling about 100,000 servings of noodles a week. 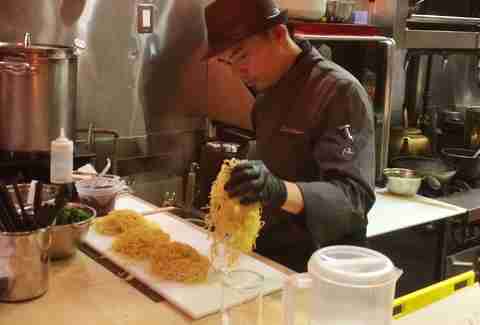 That's because the concept gives the chef a place where he can make ramen, as well as teach other up-and-coming ramen chefs how to do the same with seminars, ramen tastings, and private special events. 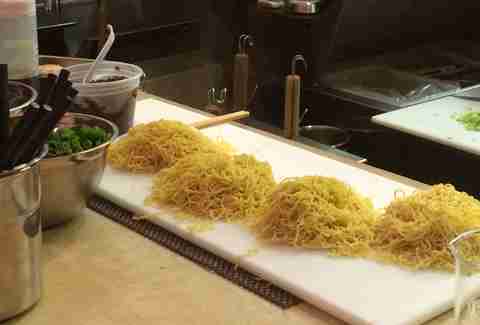 It's basically a feed-your-belly-and-mind experience, with Chef Nakamura and his killer kitchen crew explaining everything from the five building blocks of ramen, to noodle and broth pairing, to ramen history and how to slurp noodles properly. Currently, there are two ramens to choose from: the first is the Torigara Shoyu Ramen, inspired by a 105-year-old recipe that uses a clear chicken broth and pairs it with thin, wavy Sun Noodles. Toppings offered count pork chashu, menma, nori, spinach, and naruto fish cake. An optional egg is offered as well, but served on the side because the egg slightly changes the flavor of the broth. No joke, the Shoyu ramen bowl might be the best bowl of its kind in New York City. 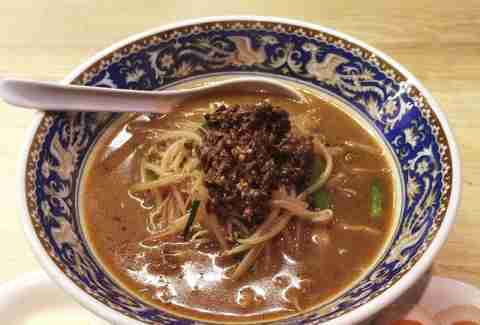 The second bowl is a vegetarian-friendly XO miso ramen made with Sun Noodle miso paste and special XO sauce developed by Kaizen Trading Company. 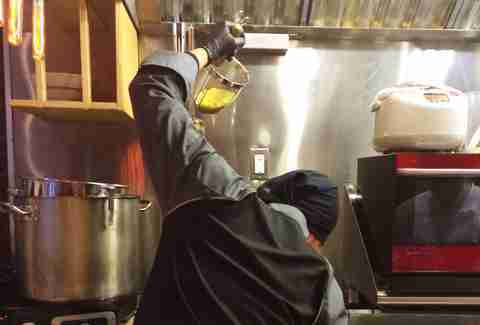 Chef Nakamura blends oolong tea in with his broth and serves it with a thicker straight noodle. Toppings include bean sprouts, nira, and scallions. Butter and eggs are also "optional" (hahahahaha... right). Fun fact: miso ramen is traditionally served hotter than other types, so your slurping skills really come into play here. The gyoza? Also worth the trip. 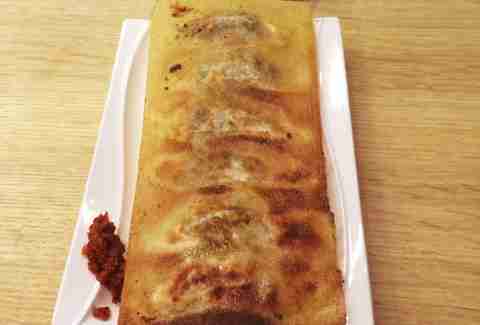 Ramen Lab had its griddle designed and specially made for this large blintz-looking block that's really six dumplings connected by a crepe-like crust. The dumpling is filled with sweet and tangy porky goodness that’s surrounded by Napa cabbage. Make sure you order the house-made hot sauce, too, as well as a cold beer and some sake. The latter two don't really have anything to do with the gyoza, but do still need to be ordered. 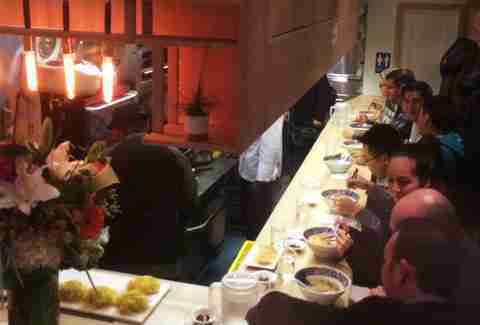 Ramen Lab plans to offer seasonal ramen as well as Chef Nakamura's famous "Ramen Flight" (a five-course ramen sampling) in the upcoming months. Jordy Trachtenberg freelances for Thrillist, chiefly to support his ramen addiction. He's the heavily tattooed head noodle behind the blog Ramentology. 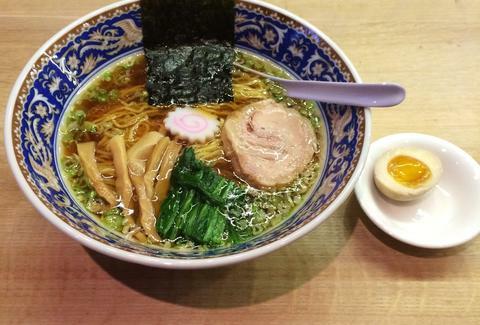 You can slurp along and follow his one-man ramen riot on Twitter, Instagram, and Facebook.